Hello! I really enjoyed hearing from Dr. Oz on Oprah's "Live your Best Life" show yesterday. During the show, Dr. Oz and Oprah checked in with a few people who despite being very unhealthy a year ago had transformed both their looks and their lives by changing their lifestyles -- through better eating, dealing better with stress, and by adopting new exercising habits. 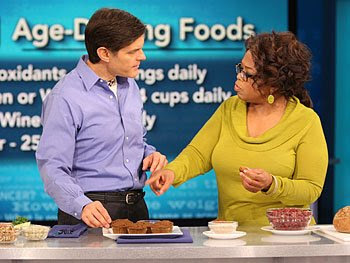 During the show, Dr. Oz gave the audience a really great list of 10 steps that everyone should take to start living a healthier life, which you can find here on oprah.com. For the sake of this post, I thought I'd specifically focus on his food advice. Step two on Dr. Oz's healthier life checklist is "know the five ingredients to avoid" in your food. When he says avoid, he means to avoid buying and eating foods for which any of the following five foods are in the first five ingredients. The bad foods are: (1) high fructose corn syrup, (2) sugar, (3) "enriched" flours (which are really the opposite of enriched), (4) trans fats (aka ingredients with the words hydrogenated in them), and (5) saturated fats (oils/fats from animals). I actually loved what he said about sugar in particular, which was basically that foods that are mainly sugar confuse our bodies since they give us a boost of energy/calories with no nutrients to process along with them. That is an interesting way to think about how our bodies respond to sugar. As you know, I never knowingly post any foods that have high fructose corn syrup or trans fats in them to Yummy Diet Food. I'm also going to try to start taking note of whether foods are void of sugar, saturated fats and enriched flours as well (*especially* in the first five ingredients). Step three on Dr. Oz's healthier life checklist is "the healthy foods to add to your diet". Dr. Oz recommends eating foods like fruits and vegetables that don't have labels, which of course goes without saying (I try to eat at least one with every meal). He also says to try to eat foods full of antioxidants (my favorites are frozen blueberries, raspberries, and dark chocolate wedges). Foods high in antioxidants are usually naturally dark in color. Secondly he recommends eating 3 grams of omega 3 fats everyday (3 of 3 -- easy to remember!). Omega 3 can be found in nuts, seafood, soybeans (edamame), squash, and in flaxseeds (remember to grind them up or else you won't reap the benefits!). The third type of food he recommends eating is fiber -- 24 grams of fiber per day. You can find fiber in fruits and vegetables, whole grain breads, many cereals like kashi, as well as in some beans and peanuts. Lastly, he recommends a tablespoon of virgin or extra virgin olive oil every day. Oil can easily be added to sauce or used to sautee vegetables. Step four on Dr. Oz's healthier life checklist is "take a multivitamin every day" -- something I always try to do since it is pretty easy. The rest of the list contains 7 other tips focused on learning about your health, starting exercising, and getting enough sleep at night. It was really a great inspiring show that reminded me to continue to carefully consider what goes into my body everyday - which makes me feel good inside and out. Those are really good tips. I watch labels, but it's still scary to see what they put in there! Who wants not lead a healthier life? Obviously everyone. Most important part of our healthier living is healthy food. I think naturals are always better than other. So, I like to be stick with any type of natural food not only milk. I believe the most important part of our healthier living is healthier food.